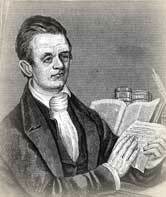 Adoniram Judson is often singled out as the first American foreign missionary. This is only partly true. When he sailed for India in 1812 he was but one of four men traveling as Congregational missionaries to the Orient. And his wife Anne was with him. The credit of evangelizing Burma is as much hers as his if only because she saved his life to carry on the work. Her ability to learn the language greatly assisted his efforts at translation and evangelism and her letters home made their adventures so vivid in the minds of Americans that Judson's name became virtually a household word. On this day, July 13, 1813, the two laid eyes for the first tome on Rangoon, the city where they began their Burmese work. It was "a miserable dirty town," they wrote. The houses were thatched. There was virtually no sewage. 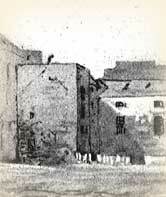 Filth flowed into the creeks and was carried off at high tide. The pair soon discovered that Christian converts would be slow in coming. Christianity was not favored by the king, and so brutal was the despotism of the overlords that the common people dared not embrace the new faith. It was five years before the Judsons baptized their first convert. In the meantime, Adoniram preached in a zyat he built in the city. He and Ann mastered the Burmese language and while Adoniram labored to translate the Bible, Ann produced a catechism. To find words to convey religious meaning, they often had to use another related language. Burmese simply lacked the necessary vocabulary. Although the Judsons sailed as Congregationalists under the mission board Adoniram had helped form, in a curious twist he did not remain Congregationalist. During the passage to India, he became convinced that his church's doctrine of baptism was incorrect. 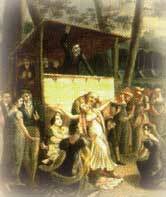 In Calcutta Adoniram and Ann were baptized by immersion. They immediately broke their connection with the board which sent them and appealed to the Baptist churches of the United States to form a new mission to support them. This became a reality and now there were two missions rather than one, both instigated in part by Judson. Expelled from India, the Judsons sailed to Burma and opened that work. In 1824, when England and Burma went to war, Adoniram was imprisoned as a spy. Ann worked night and day for his release. Both suffered greatly. Judson was hung in torturous positions. Ann lost her health, owing to a difficult labor, a tropical fever and her exertions to free her husband. The sickly child did not survive long. 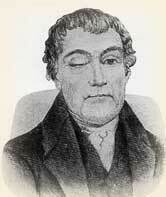 Ann died shortly after Adoniram's twenty-one month captivity ended. Afterwards Judson suffered despair-filled depression. Thirty years after Ann and he first left the United States, Judson returned to his native country for a short visit. Back in Burma he soon died. He left behind 7,000 converts. Today the Burmese church has grown to over two million Christians. July 13, 1813, was indeed a fateful day for the Judsons and the Burmese. Anderson, Courtney. To the Golden Shore. Boston: Little, Brown, 1956. Armitage, Thomas. A History of the Baptists; traced by their principles and practices, from the time of our Lord and Saviour Jesus Christ to the present. New York: Bryan, Taylor and co., 1893. Curtis, A. Kenneth, J. Stephen Lang, and Randy Petersen. 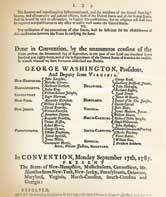 Dates with Destiny; the 100 most important dates in Church History. Tarrytown, New York: Fleming H. Revell, 1984. "Judson, Adoniram." Dictionary of American Biography. New York: Scribner, 1958 - 1964.